Should I book a car in advance? We recommend you to make advance booking, in this case you have more choice and can be sure that get a car that you looking for. But if you are already in Phuket and suddenly decided to rent a car than you always can contact us by phone and we will find car for you. How to make reservation and do you require prepayment? Fill up the booking form on main page. We do not ask advance payments, you pay full amount on delivery date. In return we ask to make reservation only when you already sure and inform us in advance in case of any changes. Is it possible to see photo of the car, choose color, etc? Our service policy first-come, first-served and provide newest car to first-come. But we can not guarantee 100% make, color, year, mileage, provide photo of the car and others narrow parameters, because can not avoid force majeure circumstances. Will have to cancel order and make refund for unused days if you already paid. Bu any way we will do our best to provide the exac car that was reserved. All cars in fleer are in good conditions because we provide scheduled and unscheduled maintenance. Security deposit for small/middle size cars 200 $ or 200 € or 5000 baht. Security deposit for big cars (SUV, Pickup) 300 $ or 300 € or 10000 baht. We don’t keep original documents. What driver's licence required to rent a car in Thailand? You will need domestic permit plus according international permit. I forget my driver's license can I use a copy? You can not rent or drive a car with copy of you driver's license. Be noted since august 2018 maximum fee in case of driving a car with out license is 50 000 THB. Can you delivery/pick up car early morning or late at night? Car will be delivered/collected in the same day in nearest working hours or on a next day. — We deliver car at the same day in working hours or next day. — At t he same day or next day driver send you to the airport. This option is available on request and need to be confirmed with delivery staff. In this case you pay extra in addition to standard delivery/pick up price if any. Phuket Drive thai staff will deliver the car to you. He already know the procedure and will help you. Agreement is maid in two languages English and Thai. Also we provide safety instructions. In case of any questions Phuket Drive staff will contact office or you can contact by yourself anytime by phone +6687 477 5544 (whatsapp, viber, line). How do you deliver and pick up car? - Write deposit and rental fee amounts. You will get 1 copy of agreement. On pick up date Phuket Drive staff will compare car condition and car gasoline level with original agreement. What gasoline level is when you deliver the car? Car will be delivered with full or almost full tank of gasoline. Gasoline level will be noted in rental agreement. On last day you need to return car with same level of gasoline or pay for deficient amount according price of full tank mentioned in agreement. Can I pay for rent in foreign currency? Payment in currency is possible, in this case company rate = Bank rate – 0,5 THB. Yes, but you have to collect car at the office only. If car delivered to you hotel or villa you will be able to pay only by cash. If you pay by card 3% will be charged extra. We accept: VISA, Mastercard, JCB, UnionPay, DinnersClub. Can I leave security deposit by credit card? At this moment can not. Do your cars have insurance? — Loss or theft with fixed excess 20,000 THB (approx. 660 $)for 1st group and 30 000 THB (approx. 1000 $) for 2nd group. 1 group: S, SM, M, ML classes – Honda Jazz/City, Toyota Vios/Yaris, Chevrolet Aveo, Mitsubishi Mirage, Honda Brio, Toyota Avanza etc. 2 group: L, XL classes – Toyota Fortuner, Toyota Camry, Ford Ranger etc. Insurance do not cover moral compensation for third party when renter is at fault. This question must be solved between renter and injured person. Can reduce deductible to zero? Can not. We use insurance only with deductible. In most cases it is more advantageous because you don’t need to pay extra for rent. We don’t use zero deductible because as experience has shown it deprives drivers of caution. If accident is doesn’t happened by your fault you will get full deposit back when return car. Whats are traffic fines in Thailand? Absence of driver's licence — maximum from year 2018 50 000 THB. Unfastened seat belt — 400 THB. No helmet — up to 500 THB бат, for driver and passenger. Talking on mobile while driving - 400 THB. Wrong parking — 400 THB. Red light — 1000 THB. If your car have been locked for wrong parking you need to take traffic tickets and pay fine in nearest police station. Contact Phuket Drive office +6687 477 5544. Do not move car until policeman or insurance officer will let you do that. If car block traffic you can move it but only if you made photo/video recording. Smile, it does work here!
! In case you wish to visit night bars or disco use taxi service instead. Accident’s investigation at night will take 2-3 time longer that in day time and insurance will not cover expenses in case of alcohol presence. I already rented your car, is it possible to extend our rental period? Yes it possible, you need to contact office and check if car is available. In case you need to continue rental period for 1-2 days, payment for extra period will be collected on last day. In case you need to continue rental period for 3 days and more our staff will meet you at the last day of current rental period and collect payment for new period. I already rented your car, can we return it earlier? Cancellation maid more than 2 days in advance (24 hrs) - full refund for unused days. Cancellation maid less then 2 days in advance (48 hrs) - 1 day rental fee charge. Cancellation maid less then 1 day in advance (24 hrs) - 2 days rental fee charge. Cancelation request can be accepted during working hour 10:00-18:00. In case cancellation reques was sent after working hour we will consider it accepted from nearest working time. In case you rent a car for long period and get discount, but after cancelation you period shorten enough to lose the discount, than before refund rental payment will be recalculated at the new price with out that discount. Cancellation request should be sent in writing to Phuket Drive contact number +6687 477 5544 by any messenger WhatsApp, Viber, Line or to email info@phuketdrive.com. What baby car seat do you have? 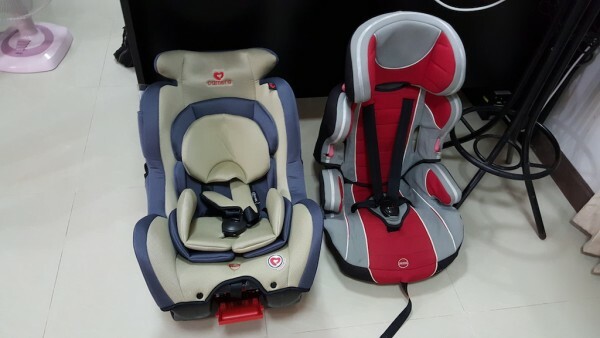 According baby seat manual it’s designed for kids from 9 months to 12 years for booster car seat and from 1 month to 12 years for convertible car seat.